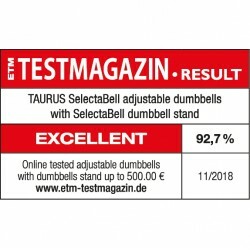 The Taurus SelectaBell combines numerous dumbbell pairs into one compact dumbbell. The advantages: you profit from saving money over buying numerous individual dumbbells. 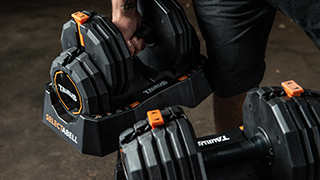 You'll also save space in your fitness room with the compact dumbbell set – and time after training not having to put away many dumbbells. Don't settle for less: Compliment your SelectaBells with the specially made dumbbell stand. The dumbbell stand is designed with a comfortable height and are ideally spaced apart. Therefore you can comfortably pick up the SelectaBells shoulder width apart directly off the stand. Also saving you unnecessary stress on your back. Compact and safer: The locking system is built that the weight plates are held from inside to outside. The Taurus SelectaBell only picks up the necessary weight plates. So that you train with the smallest dumbbell in each weight class. 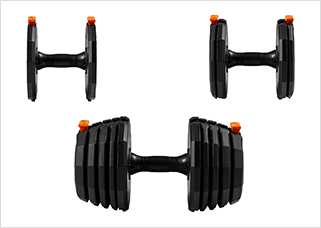 This has an important advantage: the compact dumbbell lays securely in your hand and can be perfectly balanced out. 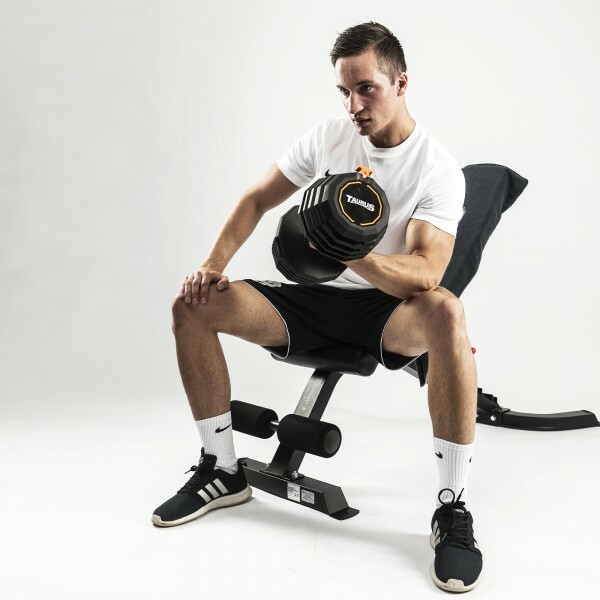 So that at all times you have optimal controll during the exercise – for maximum safety training with free weights. 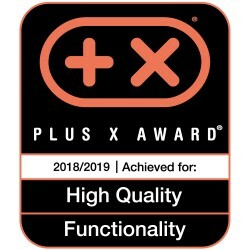 Maximum performance while training – is what Taurus fitness equipment stands for. 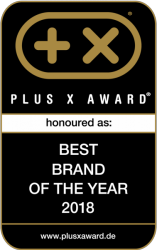 That's why this brand was awarded with the Plus X Award seal of approval „Best brand of the year 2018“. 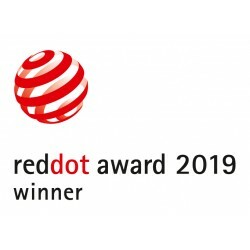 This special award for brand quality is awarded once per year to brands in which their products regularly receive branch awards. 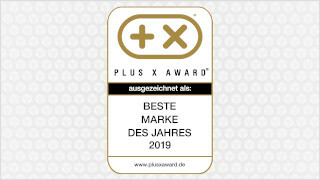 An award winning product: The TaurusSelectaBell received in 2018/19 the Plus X Award. 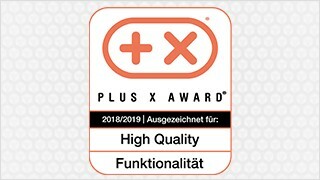 The world's largest innovation prize for Technology, Sport and Lifestyle awarded the seal of approval for High Quality and Functionality onto the strong compact dumbbell. Both seal of approvals distinguish the use of high grade materials as well as exceptional functionality. 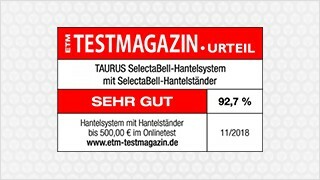 Test result „very good“ (92,7 %): In the latest dumbbell system test from the ETM test magazine (10/2018) the SelectaBell was awarded for it's exceptionally easy operation, flexible weight settings, secure grip and the excellent value for money – a modern dumbbell system for strength training at home. Everything in one place - perfectly organised! Easy weight adjustment: pull the pin, choose weight, let the pin go and lift the dumbbell. Stand dumbbell resting height: 66 cm | shoulder width apart and slightly slanted for a comfortable pick up of both dumbbells. Smaller weight increments are possible by selecting different weights on both sides of the dumbbell. This leads to a positive training effect by strengthening the underarm and wrist through the imbalance in the dumbbell. Weights not being used stay in the changing tray, that means the width changes with the weight. 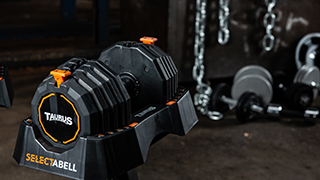 The SelectaBell is the save saving and practical compact dumbbell from Taurus: it combines numerous single dumbbells into just one dumbbell. Not only does it save space and money, but also makes dumbbell training especially comfortable. You won't need to hoard more dumbbells with each change of exercise – you'll now only have to adjust the weight. Each SelectaBell comes with its own holding tray, in which the dumbbell is stored. With its smart design it makes training double the fun. Free dumbbe training is the basis for an effective and varied strength training. Dumbbells offer a huge amount of exericses for arms, legs, back, chest and shoulders. But not every exercise would be done with the same amount of weight. The SelectaBell is the clever solution for your dumbbell training. It replaces a set of at least five dumbbells (between 4.5 and 22.5kg) or a free dumbbell, that you can change the weight plates quickly during training. Through the adjustment mechanism the ideal training weight is simple to set. At the same time the small weight increments give you an optimal range to suit your improved strength level: Over time when your get stronger, the next weight level is ready and waiting. Also when you want to train your wrist stability, you are able to adjust different weight levels on each side. Through this imbalance the supporting muscles of the wirst are trained by balancing out the new center of gravity. Also by using different weights on each end of the dumbbell the total weight can be more precisely set. Complete the Taurus SelectaBell with the matching dumbbell stand. This is especially designed for the Taurus SelectaBells. The holding trays of the dumbbells are easily attached to the frame of the dumbbell stand. At a comfortable height of 66cm the SelectaBells can be directly pick up off the stand and placed back after use, making it easier on your back. 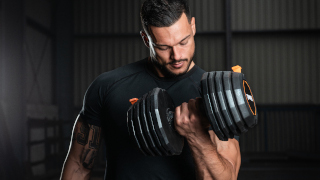 Both SelectaBells are optimally positioned, slightly angled and the ideal spacing between the dumbbells, for a comfortable pick up and return. The money saving set contains two SelectaBells and dumbbell stand. 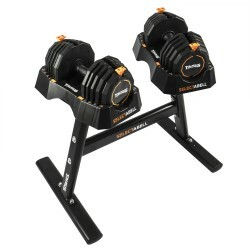 Taurus SelectaBell Dumbbell Stand In stock!